If you travel to any major city in Taiwan, you will be sure to find a Confucius Temple as there are around twenty of them spread throughout the country. Confucius temples are unlike typical over-the-top Taoist temples as they are constructed with simplicity in mind. I always tell my friends that when you visit a Taoist temple, no matter how big or small it is, you can spend hours admiring the dedication to art and the careful detail that went into the construction of the building whereas Confucius temples are completely different and almost Zen-like in how quiet and simple they are. A visit to a Taoist temple can be an exciting and noisy experience with large groups of people going about their business and a bit of sensory overload with all the beautiful colours. Confucius temples are less busy, a lot more quiet and much better if you are in a reflective type of mood seeking some solace from busy Taiwanese streets. The Hsinchu Confucius Temple (新竹孔廟) has a long history dating back to 1810. The original temple was a centre for Confucian education, and then later for general education. It was used as a dormitory for Japanese soldiers during the Japanese-Colonial period much to the disdain of the local residents who eventually got them to move out. 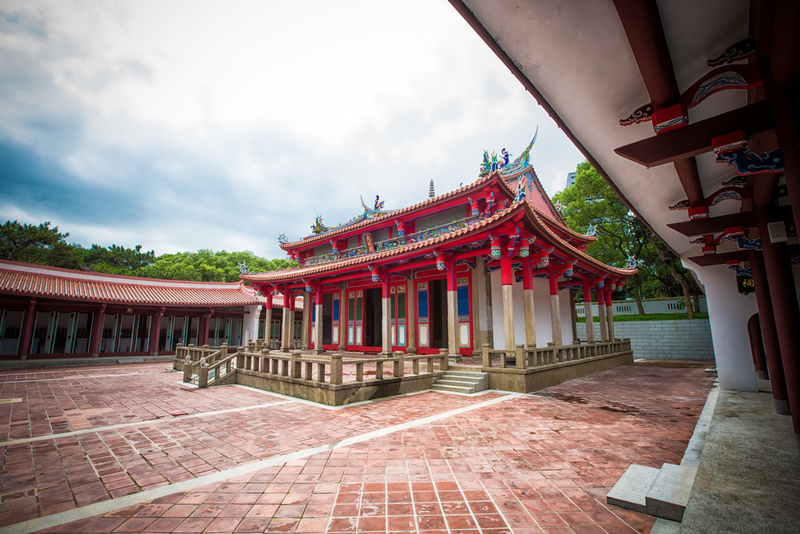 In 1975 the temple relocated to a new location situated a short walk behind the Hsinchu Train Station (新竹車站) in the Hsinchu Park (新竹公園) and has since been used primarily for ceremonial purposes as education is now the responsibility of the public school system. Like all the other Confucius temples in Taiwan, the Hsinchu temple is quiet and on the day I visited it just so happened that I was the only person there (except for the groundskeeper.) The Hsinchu Park next to the temple was quite active however with several dozen senior citizens playing checkers, drinking tea and chatting. The most important part of the temple is called the "Da Cheng Hall" (大成殿) and in it is housed "spirit tablets" (神位) which are used to designate the seat of a past ancestor or deity. The black plaque has inscriptions that are taken from the Analects of Confucius (論語) and say 「有教無類」which translates as "Education for everyone no matter what their background." Above that we have a blue plaque that has「萬世師表」which refers to Confucius as a "model teacher for all time." One of the common features of all Confucius temples is that there is no imagery or statues of Confucius. This is a rule that goes back almost 500 years to the Ming Dynasty when the emperor decreed that all Confucius temples should be uniform and only have spirit tablets rather than images of the sage. The Groundskeeper seeing me off! The Hsinchu Confucius Temple doesn't seem to be the tourist destination that its counterparts in Taipei and Tainan seem to be, but it has its own unique charm and one of the reasons I really enjoyed it was that I felt almost completed secluded while visiting! If you need some quiet time in a peaceful setting while in Hsinchu, the Confucius Temple might be the best place for you! Unless of course it is September 28th which is Confucius's Birthday and Teacher's Day - the busiest day of the year at the temple! The Temple is a short ten minute walk from the Hsinchu Train Station. When you exit the station, take the underpass to the right of station which will take you to the back of the station. From there walk straight until you reach Hsinchu Park (新竹公園) and you will find the temple at the back of the park. For more information about Taiwan’s Confucius Temple’s please check out my Confucius Temple Guide.